The workshops will offer an informal and interactive way for you to share your thoughts. The flexible format, led by facilitators, offers opportunities to get more information, provide feedback, or take part in round-table discussions as your time and interest allow. The information you provide will help the commission develop its recommendations as part of a comprehensive, independent review of our province’s elementary and secondary education system. Individuals or organizations that would like to present their perspectives and recommendations at a public hearing are invited to submit a formal brief to the commission. Only one formal brief per individual or organization will be accepted. All briefs will be considered to be a request to present at a public hearing, and in the spirit of transparency, they will be posted on the commission's website. Selected groups and individuals will be invited to present to the commission. Priority will be given to those who offer bold recommendations and innovative solutions, and those who have not already been heard from through other public engagement opportunities. 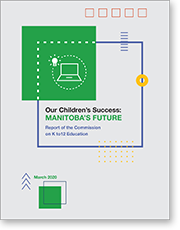 As part of the information gathering to inform the review, the commission is inviting Manitoba teachers, those currently teaching and those who are retired, to share exemplary practices they have implemented and that have resulted in increased student achievement and outcomes. In 200 words or less, you are invited to provide a brief description of your exemplary practice, outlining what you did and the results that were achieved. Please be sure to include your name and contact information, so we may contact you for additional details and clarification if necessary.